The Stellar Cat system is a complete electronic control package allowing the control of a telescope using either a Sky Commander or Argo Navis Digital Setting Circles as the reference. They can be used to control either a Dobsonian or an equatorial mount telescope. Has the ability to track or automatically follow the sky, slew (move) around at various speeds selectable by the user, and GOTO an object selected by the user. FULLY supports EasyTrack - Tracks without a DSC or PC! • "GOTO" from: - Sky Commander’s 16,000-30,000 objects, Argo Navis’ 29,000+ Objects, Argo Navis’ 1100 USER objects, Megastar, Astroplanner, The Sky 100,000 objects. • PC Planetarium View (shows scope’s position in the sky) using Megastar, Astro-planner, The Sky, and many more. • Full-featured handpad - 3-Speed selection with LED indicator, Simultaneous axis moves, Local Sync, Slip-Return, GOTO, Spiral Search. Slip Return - Someone bumps the scope accidentally (kid at a public star party!)? Want to go back to where you were? Simple: Slip Return. Remembers where it was previously and allows you to automatically return to it! True Spiral Search - Can’t find that object (not uncommon with DSC)? Want to explore the Veil, North American, Virgo, etc? SIMPLE! The Spiral Search feature will spiral out from its center point at a constant speed and width allowing you to search and explore! Two speeds/widths for different field widths. This is a "TRUE" spiral - not a box or some other shape... if left to search the whole area it will span an area of 12 sq degrees! When you want to stop simply push any of the motion buttons and it stops and tracks from there! "REALLY COOL" is the most common statement when it is used for the first time! SuperProgram Mode - "SP" mode adds multiple utilities to improve the performance and/or function of the ServoCAT equipped scope. AutoCalibrate - AutoCal allows one to commission his scope simply. This system will automatically identify and save YOUR scopes precise ratio. This will then provide the highest precision in tracking and GOTO performance. HOURS of tracking... In addition it is a great diagnostic tool for determining if and by how much your scope has encoder system errors and/or slippage. The dual pass/fail system will tell you WITHOUT a PC connected how you have done and determine the precise ratio for your scope. If a PC is connected it will print out the ratios AND the error values so you know what is what! AutoReset - Sets parameters back to the default parameters. Auto Select - Selects one of 2 parameter sets for dual scope usage. Local Sync - Allows the ServoCAT to "remember" an offset to an object thereby improving the pointing accuracy in a 5 - 10 deg radius area. Similar to the higher precision pointing offered by others. 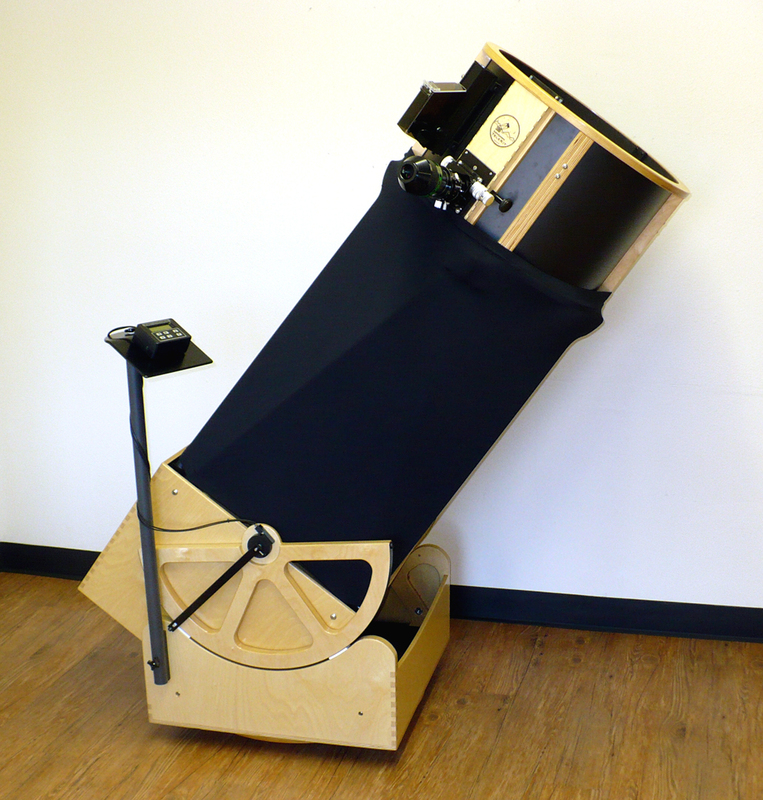 Designed specifically for smaller Dobsonian telescopes, those in the 8 - 14" size and even 15 -16" light scopes with ball bearing groundboard. Maintaining all the features of the standard ServoCAT the Junior allows fast slew rates: 7-9+ degrees/sec and more! Snappy movements and precise tracking. Features smaller gearboxes. Silent operation is the name of the game, the CAT stalks the night sky like a leopard on the prowl! Enjoy YOUR scope with the new ServoCAT Jr. 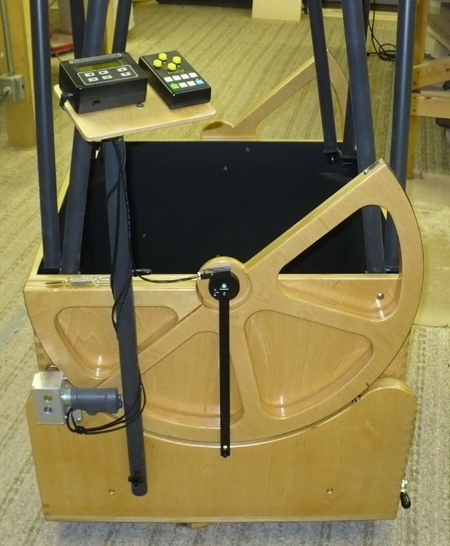 Controller, handpad, cables, (2) gearhead servo motors, hardware and complete instructions. Digital setting circles, encoder capable pivot bolt (standard on Telekit and Quantum), altitude bearing extension and a round groundboard. 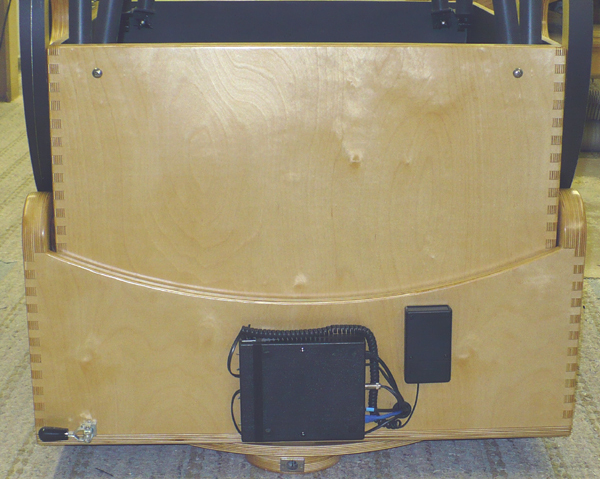 The Astrosystems Mount Stalk holds the DSC computer, either Sky Commander or Argo Navis and a drive handpad controller at a convenient 38" height. Simple installation with just 2 screws and proportioned to clear transport handles. A single Thumbknob installs the stalk. Cables for the DSC Computer, drive handpad controller, Altitude Encoder and DSC power are easily routed around the stalk. Completely finished and ready to install with supplied stainless steel hardware. Mount Stalk/Shelf with digital setting circles on TeleKit. Shelf is black ABS as seen at left, wood above is a prototype. 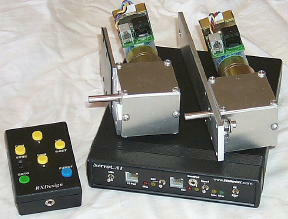 A complete set of hardware to install 12 Vdc power feedthrough to connect the Rocker Box of a Dobsonian to a remote battery. This allows you to use a high capacity battery for drives, dew removal, fans, etc. without putting the battery weight on the telescope. 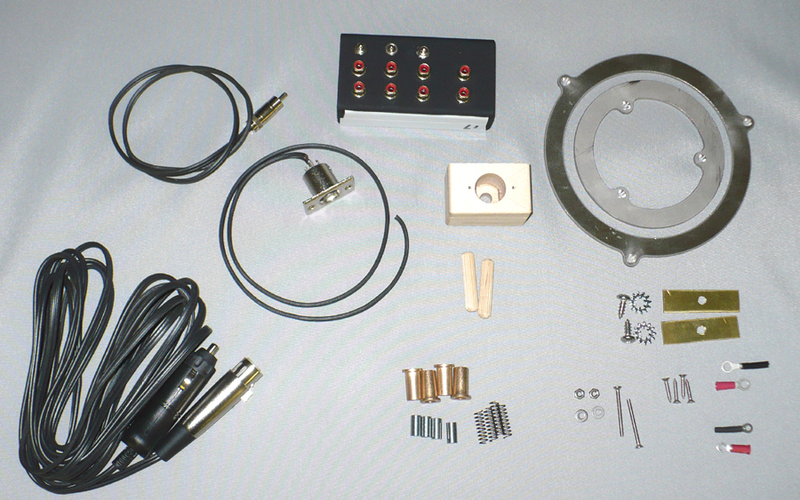 This is the hardware package to power through your existing groundboard. Easy to install, does not require a change in your existing pivot bolt or azimuth encoder. Includes power distribution rail, cables, power transfer system. Complete Hardware Set for 1/2"-3/4" Rocker Box Bottom $129.00 ShipWeight 3 lbs. Complete Hardware Set for 1-1 1/2" Rocker Box Bottom $149.00 ShipWeight 3 lbs. 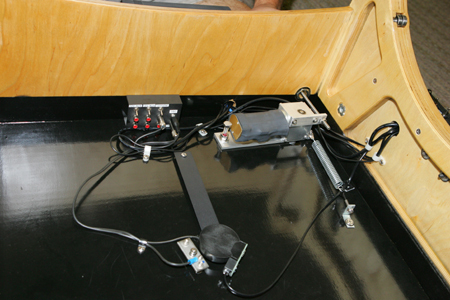 PDF Instructions for Astrosystems Powered Ground Board installation. Retrofiting your telescope with a GOTO drive? Use our precision CNC cut round Ground Board for accuracy. Our Ground Boards feature Baltic Birch plywood, strong and very wear resistant as well as one foot having an internal mount for the Power Feed Through plug. 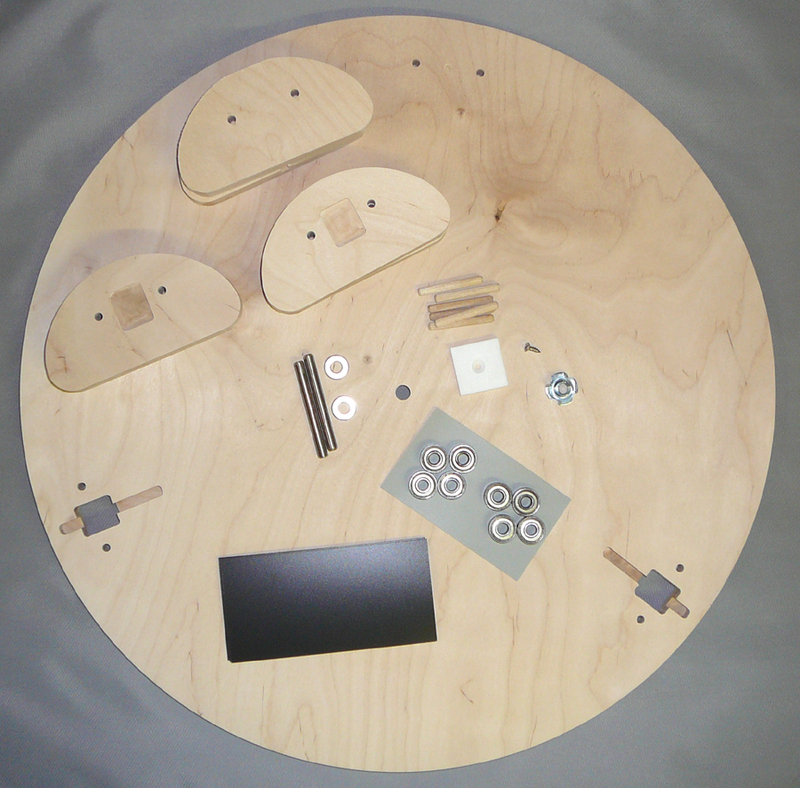 Each comes with ball bearings at two positions and Teflon at the third (requires smooth laminate on the Rocker Box bottom). Smooth movement for lower torque and longer battery life. We can supply with three Teflon pads if you prefer, although the hybrid bearing system works great on textured (Ebony Star or Pebble Board) laminate on the Rocker Box. The sizes listed below are a guide, use the largest bearing radius that your rocker box will accommodate. AC Power Supply 100 - 264VAC input 50/60 Hz 12V regulated output 66W (15V @ 4.4A equivalent to 12V @ 5.5A) output for ServoCAT, DSC, fan. Wireless 232 Connect your PC planetarium program to the ServoCAT seamlessly! Complete with AC adapters for both units. One 12V power cord. 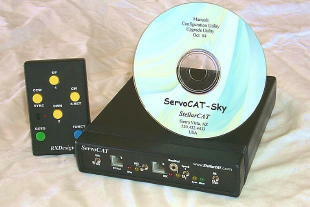 ServoCAT PC adapter to plug in. GOTO Button Allows "remote" GOTO's without the handpad. Remote Status Unit Allows remote location of the diagnostic LEDs/Switches.